Three Department of State-supported international exchange program alumni were among 19 individuals who were awarded the Presidential Medal of Freedom by President Barack Obama on November 24, 2014. Alvin Ailey was a choreographer, dancer, and the founder of the Alvin Ailey American Dance Theater, which is renowned for its inspiring performances for an estimated 25 million people at theaters in 48 states and in 71 countries on six continents since 1958. Ailey’s work was groundbreaking in its exploration of the African American experience and the enrichment of the modern dance tradition. The Ailey company, based in New York City, carries on his pioneering legacy with performances, training, educational, and community programs for people of all backgrounds. Ailey traveled to Mexico on a U.S. government grant to present a version of his dance company’s most famous work, Revelations, for the 1968 Summer Olympics Opening Ceremony in Mexico City. ECA has continued to collaborate with the Alvin Ailey company throughout the years. 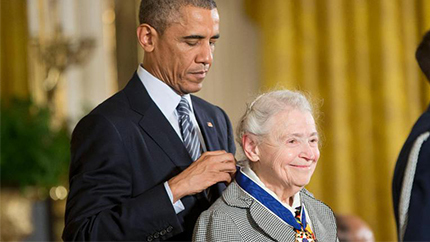 Mildred Dresselhaus is one of the most prominent physicists, materials scientists, and electrical engineers of her generation. A professor of physics and electrical engineering at MIT, she is best known for her research on condensed matter systems and the atomic properties of carbon, which has contributed to major advances in electronics and materials research. Abner Mikva is a public servant who has served with distinction in all three branches of government. He was a five-term Congressman from Illinois, chief judge of the United States Court of Appeals for the D.C. Circuit, and White House counsel for President Bill Clinton. He has also served as a law professor at Northwestern University, the University of Chicago, and the University of Illinois. The Presidential Medal of Freedom is the Nation’s highest civilian honor, presented to individuals who have made especially meritorious contributions to the security or national interests of the United States, to world peace, or to cultural or other significant public or private endeavors. “Once a year we set aside this event to celebrate people who have made America stronger, and wiser, and more humane, and more beautiful,” Obama stated at the White House ceremony. The full list of 2014 Presidential Medal of Freedom recipients is available here.